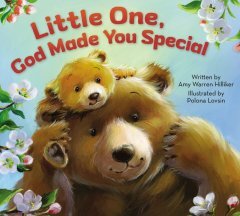 God made you special, little one. There's no one like you - no, not one! No one has your tiny nose, or your wiggly, squiggly toes. No one has your silly laugh when you splash in bubble baths. No one has your perfect chin, that sits below your perfect grin. You are perfect, little one. There's no one like you - no, not one! While I appreciate the sentiment and meaning behind the book - to teach children that they are loved and have a purpose, I feel this is a fairly amateur attempt at it. I just wish that the words were a bit better crafted as the illustrations in this book alone make it a piece of art. The words let the rest down I feel. To me the rhymes could have been worked on more especially the line: 'No one has your silly laugh when you splash in bubble baths'. Then the line 'God made you special from the start to rhyme with 'heart' is such an overused rhyme. This is the kind of rhyming a child would write, not an adult. I would still recommend it however for the artwork throughout alone. Absolutely stunning art done by Polona Lovsin. Please note that Booklook sent me a copy of this book for my review. This review is entirely my own.